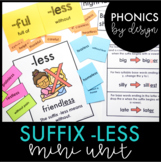 Suffix LESS activity, matching, sentences, and quiz! This worksheet can be run front/back. 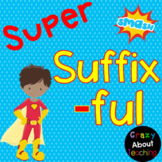 On one side students must write the 'new' word using the meanings of the suffixes -ful and -less. On the other side, students will sort words into base words, words meaning to be full of, and without ___. Enjoy! 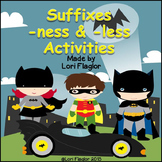 Know the Code: Suffix "-less"
This is a 10 slide power point presentation focusing on the suffix -less. It presents many words and their meanings. It also focuses on base words. Practice identifying the root word, meaning of the suffix and the new meaning of a word with a suffix. The lesson includes a do now, we do, you do and exit ticket. 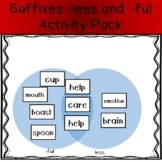 A handout for vocabulary building with the suffix "-less". Includes exercises and a chart with explanations and examples. Thank you for viewing my teaching materials, when you download these pages, you just saved yourself hours of preparations and time creating and structuring your educational program to support your students to the highest level. I created a program to support you; so that your teaching is made easy! The Do-Now reviews prefixes learned from previous unit. There is an I-do, We-do and You-do portion and the Exit Ticket all included. 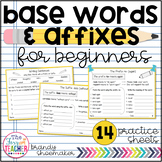 This activity comes with 18 words to match with the suffix -less or -ness. Enjoy! This is a two-page worksheet that may or may not be used with my Super Suffixes PPT.